There’s a moment when you crest a hill just outside Pilton village and get a perfect view down over Worthy Farm. I crested that hill just over a week ago on the top deck of a packed double-decker bus and suddenly caught a glimpse of the Glastonbury Festival site. There’s something almost biblical about the size of the crowd and the scale of the event. 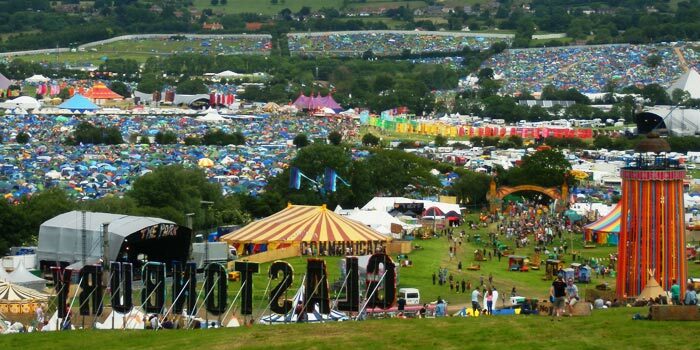 Home to over 180,000 people for several days every June – Glastonbury temporarily becomes the third largest city in the South West. It’s a remarkable feat. The sheer volume of people and the amount of stuff they require and generate is frankly astounding. For somewhere which has always had green credentials and a very visible undercurrent of environmentalism and activism, bringing those people together has some pretty serious ramifications. To start with, Glastonbury is, quite frankly, in the middle of nowhere, so getting 180,000 staff, revellers, artists and hangers on there is logistically challenging to say the least. Getting them there in an environmentally friendly way is even more difficult. For the last two editions of the festival, Glastonbury’s organisers have tried to encourage more and more people to take buses, trains or share lifts when they’re heading to the site with their Green Traveller initiative. The idea is simple. People who travel to the festival on bikes, buses or trains get a special green lanyard entitling them to discounts, freebies and much more. They’re also eligible to win spot prizes simply by wearing the lanyards during the festival – this year, people ended up backstage, watching gigs from the side of the stage, winning free hampers, subscriptions to magazines and much more – just for choosing to come to the festival in a more environmentally friendly way. In 2011, more than 42,000 people got to Glastonbury by bus, bike or train. There were 4,500 fewer cars there. While the dust is still (literally) setting on this year’s festival, based on the sheer volume of green lanyards on display in all of the fields, those numbers are likely to be closer to 60,000 and 6,000. It’s not only the prizes that drew people in – the access helped. Driving to and parking at any festival is invariably an exercise in abject frustration and generally only serves to increase ones blood pressure. Getting the bus means you’re not wasting petrol and belching out fumes in a traffic jam, you get priority access in bus lanes, you get right to the festival gate rather than getting to a car parking space three miles away and you end up getting your festival started far sooner. The success of the Green Traveller initiative shows that the correct combination of incentives can have a hugely positive result. All weekend long, I saw people wandering around with their green lanyards. I saw tweets talking about it and people celebrating the spot prizes they received. As a campaign, you could argue that they were talking to an audience that was already converted, but even still – the level of awareness and discussion was huge – making it an even bigger success. Plus people en route to the festival got to sit on a bus with dozens of other people waiting for the climb up the hill to end before getting their first view of the festival site. They all had that moment when they realised they were finally at Glastonbury and the real fun could begin. I much prefer travelling by coach, it’s more friendly and I can have a drink. Before the ticket and coach package came along we just jumped on the badger bus from Bath, where we live: simples. Now the prescribed coach package means that option is no longer available and we can’t choose our departure time or our return time. This year, we’ll be living in Midsomer Norton which is only 10 miles from the festival. As we’ve had no option but to go for the Glastonbury coach package, which leaves Bath at 6.45am on Thursday morning, we’ll probably have to get a taxi from Midsomer to Bath, then do the 20 mile journey on coach from Bath to the festival. We’ll have to repeat this on the way home. So the supposedly “green” coach initiative will force us to travel an extra forty miles, twenty by car, and cost an extra £60 in taxis. Much better would have been to simply price parking tickets in such a way as to encourage people to arrive by coach. Or at least offer a coach service which picks up from a variety of places en route. Direct transport is the most expensive and least efficient kind.